We describe a new genus of Mantophasmatodea, Viridiphasma gen. n. (Austrophasmatidae), represented by one new species, V. clanwilliamense sp. 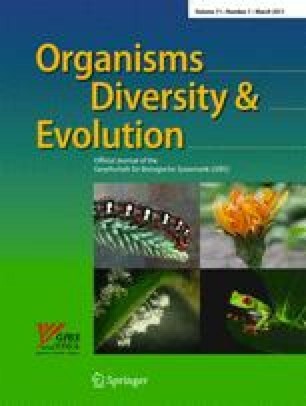 n. The new species differs from previously described species in features of the male and female postabdomen including the genitalia, in morphometrics and details of colouration. The new species occurs syntopically with another austrophasmatid, Karoophasma biedouwense Klass et al., 2003; this is the first well-documented case of sympatry of two mantophasmatodean species. We therefore survey the morphological differences between these two species, document the absence of any morphological evidence of hybridisation, and also report on differences in life history. While a previous molecular phylogeny using COI and 16S genes ambiguously placed V. clanwilliamense sp. n. near the base of Austrophasmatidae (but not as sister to all other Austrophasmatidae), morphological characters strongly support V. clanwilliamense sp. n. to be the sister taxon of a clade comprising all remaining Austrophasmatidae. This phylogenetic placement challenges the current hypothesis of a linear north-to-south diversification of Austrophasmatidae. We would like to thank S. H. Eberhard for providing photographs for Fig. 1. Cape Nature is thanked for permit AAA007-00020-0035 to collect Mantophasmatodea and undertake this work at Clanwilliam. We thank Olaf Bininda-Emonds and two anonymous referees for helpful comments on the manuscript. M.P. received financial support through a University of Cape Town URC grant, M.J.B.E. was financially supported by a doc.award (University of Vienna, Kulturabteilung Stadt Wien).